The LG Nexus 4 is a great deal in the US considering its super-low off-contract price of $299 through the Google Play Store, as well as its superb hardware like the Snapdragon S4 Pro chipset and 2 gigs of RAM. But it turns out the handset might be a bit less competitive when it comes to its battery life. AnandTech has conducted a series of tests, which seem to prove that the Nexus 4 is struggling to offer battery life similar to that of its rivals. 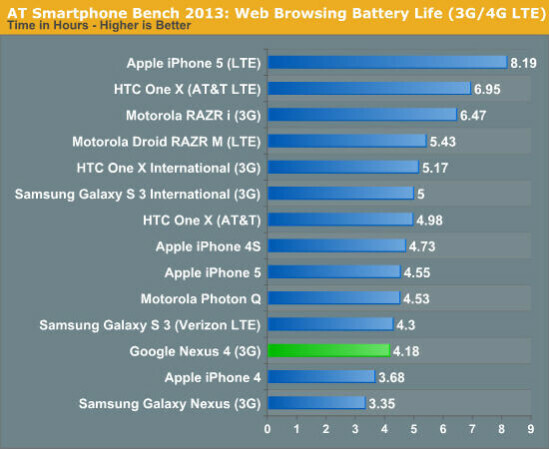 For example, a web browsing-based test measuring the battery life on 3G and LTE shows the LTE-free Nexus 4 achieving the modest 4.18 hours. In comparison, the LTE-powered iPhone 5 leads the chart with the healthy 8.19 hours. Major Android handset, like the One X and GS III also fare better than LG's creation. When doing the same test over Wi-Fi connection, the Nexus 4 once again scores poorly with 6.27 hours, bested by the iPhone 5 with 10.27, One X (AT&T) with 9.93 and others. So, it turns out that even without LTE, the Nexus 4 may have a bit of a problem with its battery life. Although it's less than impressive, though, we're sure that the handset will be able to stay powered for at least a day with a full charge, though you might want to keep that brightness slider somewhere closer to the middle. All pre-release speculation. Wait until the final product to pass judgement. 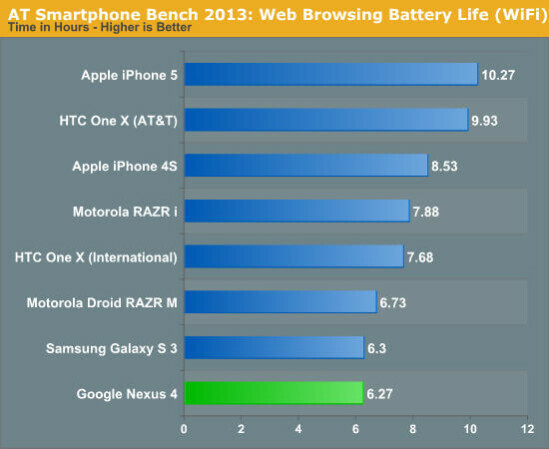 Actually Nexus 4 is not doing badly, it's close to SGS3 and iPhone 5. But I'm sure that after Google refines Android 4.2 it will be much better. I'm hoping that the final 4.2 makes better than this! But it's not close to the iPhone 5, man! it is ~50% lower! Pre release speculation..That's VERY DOUBTFUL the folks over at anandtech has been in this game a long time they are a relaible source without question. It's Lg I can't see why they would make this up. It's not like I wanted this device anyway. The Galaxy Nexus on Verizon was PISS POOR with battery life so I'm not to surprise by this. The Galaxy Note 2 pimp slaps any Lg Nexus or Lg Optimus G as well..
Did LG drop the ball on this? perhaps Google should stick with Samsung... just saying... if LG can't offer the full package, as great the nexus is, it won't appeal to many. what are you talking about? the phone is based on the Optimus G, a phone that is praised for its spec sheet. it is the software that isn't ready yet, nothing to do with LG. Agreed, I like Nexus 4 much more than GNex, especially the screen. JB 4.2 is still new and needs some refinement, that's all. So I guess you've seen the Nexus 4 in person? There aren't even comparison videos. I saw the videos too, but they said the display is slightly worse or at best, on par with the One X. One review said that it was dim with very good viewing angles. There were no comparisons to the Gnex, and we both know that in person they all look different. That's because you rely too much on online reviews. I've compared the Gnex to the One X and I like the Gnexs' display better because of the deep blacks, and I don't mind the PenTile tech used. Can't stand the gray shade of black on LCD units and colour shifts when changing viewing angles, as some people can't stand the PenTile matrix or the oversaturated colours on Amoled. Well, SS made 2 Nexuses and none was successful. Now it's LG's chance so let's wait and see how things work out. I agree that the Nexus 4 is probably the best Android phone right now(at least on paper), as you can see lower in the comments. My point was to hold off the statements until the N4 is launched and we're able to compare both in person. I don't know if you remember but the Galaxy Nexus didn't have an stellar battery life either. The only things that most people envy on the N4 is LTE,the chipset and the screen. I've heard mostly complaints about memory, the glass back, some pricing issue and bla bla bla...Now add the battery life to the equation. Not saying GNxus is better in anyway. I like nexus devices for the updates only. I'll still stick with the company's respective flagships for the complete package. I praised its design. Pricing is still very high in my region. The rest of its specs aren't spectacular except for the processor. According to The Verge and this test the Nexus 4 lasts longer on a single charge, better camera(The Verge, Engadget...), faster CPU, more RAM and better build quality than the GNex. How is this not the "full" package, since they both lack LTE it is excluded from the "fullnes" of the package. But since I'm a sucker for Amoled I would've preferred Samsung, if they matched the price. I personally think Samsung refused to make another Nexus device. Samsung, purposely crippled the GNx with a piss poor battery, speaker, and camera. They knew the S3 was looming over the horizon. Google get some b**ls, you own Motorola now. Built a device with good hardware and removable storage. I pretty much bet they'll sell more than one million devices.